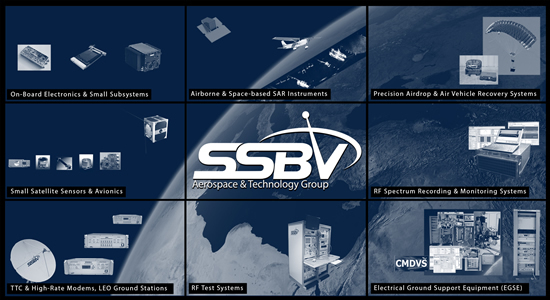 SSBV is a technology driven organisation, active in the domains of (aero)Space, Remote Sensing & Monitoring, Defence & Security and the development of High-Tech Systems. Based on in-house technology, engineering, assembly and test skills, SSBV provides complete (sub)system as well as unit level solutions. Smallsat-based Synthetic Aperture Radar (SAR) solutions. The activities in the Defence and Security domain include the ACRIDS family of Precision Airdrop and UAV recovery systems, SIGINT/COMINT products and compact Synthetic Aperture Radar solutions for airborne and ground-based applications. Through internally available systems, infrastructure and experience, also remote sensing and monitoring services are provided. SSBV is also building its own Ground Station Network (GSN) to support regional data reception and satellite control & monitoring services. SSBV Aerospace & Technology Group provides and supports the overall coordination, business development, marketing, technology investment, external relations as well as legal and financial support to all SSBV companies in the group as well as the SSBV partnership companies. SSBV Space & Ground Systems (NL/UK) is a high-tech engineering company that designs and provides innovative solutions for space and ground applications. For the ground segment, it focuses on Simulation & Testing (EGSE), TTC & TM/TC Systems, RF Test Systems, Earth Observation ground stations, High-Rate & TTC Modems and Data Processing Systems. In the space domain, the company provides smallsat sensors and subsystems, cubesat subsystems and sensors as well as a new generation of on-board computer, payload data processor and TTC and payload data transponders for the commercial smallsat market. The company also leads the development and in-orbit demonstration of highly capable, yet affordable FMCW X-Band SAR radar for smallsats. SSBV Remote Sensing & Monitoring focuses on the provision of remote sensing and monitoring services based on the use of ground-, air- and space-borne sensors, data systems and infrastructure available from the SSBV Group as well as strategic partners. 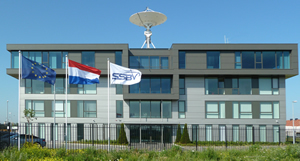 The company also operates the SSBV Ground Station Network (GSN) that comprises a number of Earth Stations across the globe, focusing on regional operation. 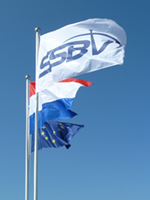 In co-operation with Metasensing B.V. (member of the SSBV Group) the company also operates airplanes for airborne SAR based mapping and observation services. SSBV Defence & Security focuses on the provision of subsystems and services related to Defence and Security, utilising products, technology and experience available from within the other SSBV Group companies as well as its own products. These include field-proven SIGINT products related to RF / Spectrum recording and analysis, compact and low-power airborne SAR systems, the ACRIDS family of Precision Airdrop Systems as well as remote sensing & monitoring systems and services. The SSBV Aerospace & Technology Group also invests in a number of other technology-driven SMEs. The know-how, products and technologies within these partnership companies are available throughout the SSBV companies, whereas SSBV provides access to technology/IP, engineering, production, business development, financial and marketing & sales support.